The most common excuse I hear from people for not exercising is time. They say they have no time. I get it. We live in a busy world, always running from one event to the next. Throw kids into the mix, and your time is not your own. Their schedule is your schedule. Take all of this into account, and when are YOU supposed to exercise! In my experience, people generally exercise less as they age. However, the older you get, it is even more important to exercise for your health and to increase the quality of your life. An interesting factor that goes into whether you exercise as you age is your spouse’s exercise routine, or lack thereof. According to researchers from Johns Hopkins University and data from a large-scale study found that spouses influence each other’s exercise habits, for better and worse, more than is often recognized. 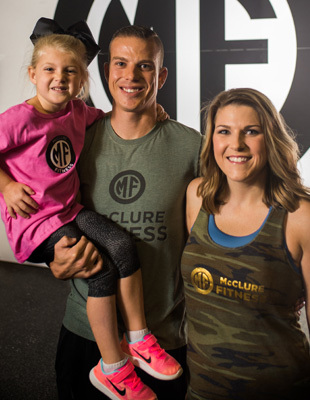 The study discovered that changes in one spouse’s routine tended to be echoed in the other’s, highlighting the extent to which our exercise behavior is shaped not just by our personal intentions but by the people around us as well. This research showed that someone who exercised regularly when single was more likely to continue to exercise after they got married if their spouse also exercised. Parenthood had the greatest downward pull on exercise time. So, back to time. When exactly are you supposed to get your fitness on with your busy, busy life? I promise this: If you work out WITH your spouse, the proverbial “kill two birds with one stone” applies. Not only are you taking care of you, but you are encouraging your spouse in their health. I started working out in 2012 by myself. I had friends who worked out with me, and while that was great, I always tried to get my husband, Cody, to come with me. He considered himself fit and preferred to work out alone in a traditional gym setting, not seeing the appeal of group fitness classes. Finally, two years ago, he agreed to come with me and saw what all the fuss was about. For two years now, we have been working out at least twice a week together. He has been my biggest cheerleader. Having him there in the gym with me keeps me encouraged during the class and also helps me stay on track outside of the gym. We both know if we indulge on a date night or cheat meal, we’re going to be working hard in the gym together the next day. The friendly competition between us is also fun! An added bonus is that the studio offers free childcare, so we can take our four-year-old daughter with us. She knows that going to the gym and staying healthy is important to her parents. Cody and I recently started a burpee challenge together with some of our friends.